An Act to prohibit marriages or civil unions between Nigerian males and white females and other matters related thereto. 1. Marriage Contract or civil union entered between a Nigerian black male and a white female is hereby prohibited in Nigeria. It is not good. 7. Anyone engaged in the public show of interracial amorous relationship commits an offence attracting in the first instance a term of 14 years imprisonment and if repeated, forcible marriage (and consummation) with a black woman of the court’s choosing. b. Evidence of a man being infertile, such evidence being from a government hospital of national repute, doctors of which must not have gone on strike in the past six months. White women can take our infertile men, as long as the men wear dark grey triangles on all items of clothing so that they are not mistakenly arrested for offences in section 6 above. I have to write about America. Again. All my well-wishers have advised against it, especially as I do not yet have an American visa. And every Nigerian traveller knows that all actions need to be filtered for things that can jeopardize a visa application to a first world country. I realize the potential damage to my hustle but my calculation is that by the time I will have achieved the American visa requirements of “strong social and economic ties”, they might have forgotten about this article. You may say: what if God should bless your hustle sooner than you expect and you need to apply for an American visa, would you not have spoilt your chances? I say: let us not preempt God. The racial tensions in America worsen by the day. One would expect that after the last few cases of police brutality and callous shootings of black people captured on camera, things would at least slow down. In the one year since the watershed event at Ferguson, Missouri where an unarmed Michael Brown was shot to death by a white police officer leading to massive protests and violence, over 300 African Americans have lost their lives in interaction with law enforcement officials. For the past year since the senseless killing of Michael Brown, the extraordinary turbulence happening in the greatest nation on earth has not gone unnoticed. I might have spoken up earlier but I myself was preparing for a turbulent election where I sought to dislodge politicians feeding fat on poor Nigerians. The battle was tough, but that is a matter for another day. Today it is time to speak up. Like I said once, I belong to everybody, and this includes America. In city after city in America, black people are rising up to demand basic human rights and dignity in the face of police brutality. The wind of change that brought us into power has not stopped blowing and although it has achieved certain success in Nigeria we wish to redirect that wind to America. The events in Ferguson and the violent outbursts that have justifiably followed again and again, show us that strategies of repression reminiscent of a country under military rule are no longer sustainable. Social media and 24 hour cable television has exposed a world of astonishing contradictions where standards for global human rights are set but broken in the most brazen way. I hear the voices from black America and they sound to me like the clear yearnings for change. I recognize those voices the same way I recognized the millions of voices in Kano, in Kaduna, in Lagos. In too many black neighborhoods in America, power has been concentrated in the hands of a few white policemen and politicians. But I tell you, change must come to America. It is not enough to have an African American as president without the collective political will to change the decades of systematic abuse of minorities. The wind of change can be delayed but it cannot be stopped. Nigeria opposes the use of violence and repression against the minorities of America. We look forward to working with all who embrace genuine and inclusive democracy – one that includes descendants of former slaves as well as descendants of former slave owners. As a last resort however, we will encourage the movement of minorities to Nigeria at no cost to them. Getting a Nigerian visa is relatively easy. Even an ISIS leader and fugitive from Lebanon recently got a visa to come into Nigeria. If someone in a terror group can easily get a visa, how much more a legitimate American fleeing persecution and violence? I am not saying that we welcome terrorists and in fact we have ordered an investigation into the matter, but I am just giving you evidence that it is easy to come here. In fact I am informed by some of my aides that it is possible to buy a Nigerian passport. While we are doing our utmost to stop that, we urge as many black Americans as possible to take advantage of the window before I actually appoint officials and Ministers sometime in September. Ultimately, it is for the blacks to take action. Whether they choose to remain in a country that tries to kill them off or take the easier route of getting Nigerian travel documents, we are committed to helping in any way that we can. That is the least we can do after helping us to dislodge the PDP. God bless Nigeria and long live the oppressed black minorities of America. PS. I also recommend that President Buhari updates the travel warning for Nigerians travelling to the United States. He is a busy guy so I have gone ahead and written the travel advice for him here. Today I am interrupting my usual commentary to tell you a fictional story about a governor and a senator. Sometimes inspiration just comes to me unannounced like power outages in Nigeria. Remember: all characters appearing in this work are fictitious. Any resemblance to real persons, living or dead, is purely coincidental. Somehow being an activist paid off, because eventually, in addition to his prison experiences he became able to chip in the fact that he has a house in London and Abuja. 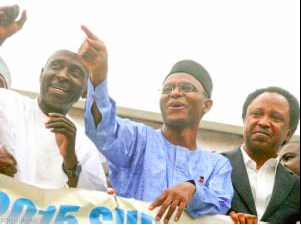 Once upon a time, while all of this was happening to the senator, there was a governor. This governor was not always a governor. He was once a Minister who tried to do his job, even though of course many of his friends and the people around him were corrupt. He too had a receding hairline but wasn’t presumptuous enough to grow an afro. Lack of confidence. He won elections in the same state as the senator but because of his wickedness, decided to begin work right away. No break. No room for business as usual. No allowing the poor people used to dysfunction enjoy the last bits of dysfunction. Wickedness! The senator hated this. He thought that he had set a good example for the governor to follow by giving the poor masses horse meat (or was it camel meat, I still can’t recall). He told the whole world that the governor hated the people by getting right into development and reforms instead of feeding them first. And the senator was wise in saying this. Just as when you find a starving, sickly person at the point of death, you do not pump them with solid food immediately but slowly introduce liquids and light food, you do not begin governing a state by trying to change things, no matter how bad they are. Sometimes, all poor people need is the meat of an animal bigger than that of a ram. This governor did even worse things. He stopped people from stealing government land and reduced waste by cutting his own salary and the number of appointees. He also tried to stop people from begging in the streets. The senator was so indignant (rightly), he spat onto the floor. What kind of governor stops people from encroaching on government land? Is democracy not a government of the people by the people and for the people? Does this not then mean that if you steal government land, it is not really stealing because you are the people and the people are the government? If you take a shirt from your own wardrobe, is it stealing? And really we all know how colorful a city can be with beggars singing praise songs at junctions and traffic lights. A city without its beggars is a poor city, without a soul. Where will people who need to do rituals that involve giving food to beggars find beggars if we drive them out? What if the beggars went on strike and refused to be part of the system through which prayers of God-fearing hustlers are answered? That would be a disaster! The senator knew all of this and so he proceeded to denounce the balding governor in public, calling him an enemy of the people. The senator was oh, so wise. And one important fact is that while the governor wore glasses, the senator did not. Meaning that the senator could see better. Who knows, maybe the governor was blind. Blind to how development and change can actually hurt a state. Blind to the nutritional value of horse meat (or was it camels now, I forget). Blind to the fact that sometimes you must take a horse to the river and give it a straw to make life easier; that sometimes you do not teach a man to catch fish when he is hungry: you simply give him horse meat (or camel meat) which will last longer in his stomach than fish. Some people lied about the senator saying he was already trying to replace the governor at the next elections and that was why he was upset. But the senator was not blind. All the senator wanted was to show the people the way, especially as his eyesight was better. And as someone who created these fictional characters, I can assure you the senator was not interested in becoming governor. This my dear readers is the moral of the story: Camels and horses are better than rams, and nobody, really, likes real change when they can have horse or camel suya. Thanks and God bless for listening. PS. Forgive me, I am still working on deciding on whether to use horses or camels for the story. I’ll let you know. Life is hard for humans. But even tougher for animals. I was filled with outrage recently when I read of this American dentist who paid 55,000 dollars to shoot a lion in Zimbabwe. Not just any lion. A lion with a name. Cecil. Let us pause for a moment to talk about Cecil. Writing about this is very emotional for me, but I will try. Cecil must have grown up in a pride of lions not knowing if he was going to survive. Only one in eight male lions ever make it into adulthood. If they are not killed by adult lions, they die of hunger, injuries or illnesses. Then by the time Cecil would have reached the age of sexual maturity for lions, the other members of the pride would have done the ritual of kicking him out to fend for himself, alone, in the wild. Because that is what lions do to males that reach maturity. It’s a bit like how white people make their kids leave home and get jobs after they are 18. Lions are not like black people who live with their parents until they get married. To survive, Cecil would have had to find his own home and this might have involved taking over new territory and possible face aggression from the new pride they will be entering. Cecil did all this and became that one-in-eight male lions that make it to adulthood. Cecil lived until the ripe lion age of 13 and fathered many cubs. While Cecil was going about the business of catering for his pride, a white American dentist was preparing his bow and arrow with which he would kill the lion. Cecil would eventually get shot, wander around in pain for 40 hours, be tracked down by the dentist and beheaded. Let me get some tissue. It cost 55,000 dollars to kill Cecil. I know 72% of Zimbabweans live on less than 1.25 dollars a day but I do not know their names. I know Cecil’s name. And today we are talking about Cecil. I am angry about a few things. First, I am thinking of what 55,000 dollars can do for me. I would easily have let that man shoot me in the thigh or something for half that amount. Cecil would have been alive today. I don’t mind dressing up like an animal since what really gives him the thrill is shooting animals. I would grow a mane if I had to. And I am not even saying the whole amount. Just half. I know that in the US there have been at least two black people lost to police-related deaths in the media recently. There was of course global outrage but nothing close to what Cecil got. And that is how it should be. After all Cecil was said to be the most popular lion in Zimbabwe. The poor black people in Zimbabwe and those black Americans who died at the hands of white police officers are all regular people. It would be unfair to try to compare Cecil, with a regular, unknown black person – Cecil who by sheer dint of hard work, determination and good fortune rose through the ranks and beat the odds to live for 13 years. No. One thing we know about male lions is that if the head of a pride dies (or say leaves his family to go start a new one elsewhere like some Nigerian men), the male that takes over the pride will kill the cubs of the previous head. Simple self-preservation. Every male lion wants his own children to inherit him, not the children of some other male. 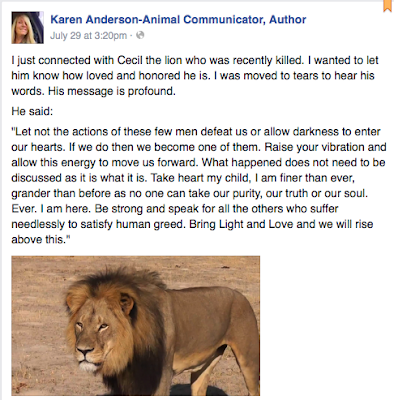 What this means is that not only Cecil, but his entire lineage is now probably wiped out. Think of that. No Cecil junior. Ever. Hold on. I need some tissue. I am not so devastated after reading those words. It is helpful that Cecil spoke clear articulate English to Karen Anderson. Think if he had spoken in one of the Zimbabwean languages, or even in an accent so strong she couldn’t understand. Then Karen would have thought her skills had failed her and we would all have gone through life depressed about the fate of Cecil. God bless Karen Anderson. God bless Cecil. God bless everyone who has been outraged about this horrific killing. They say a living dog is better than a dead lion. But not a dead lion with a name. Not Cecil. Show Cecil you care. Look for an online petition relating to this killing and sign it. Cecil will know. And Cecil will appreciate it. Ps. A US petition to extradite the lion-killer dentist has surpassed 100,000 signatures. I love it that Americans can rally together when it really matters.